Structural engineer and expert framer Tim Garrison presents his assessment and recommendations from a recent framing inspection. Green framing, or advanced framing, has been a hot topic for at least a decade. A Google search results in more than 20 million items. Even if you discount half as irrelevant, you’re still left with a vast body of published information. So the question is: To what degree has our industry really embraced green framing? From what I’ve seen in the field, the answer is: very little. I know that change is hard; doing things differently takes time. But green framing is such an easy plum. Every builder interested in profit should by now have jumped on the bandwagon and plucked that low-hanging fruit. It’s a duck, really. Using less wood, concrete, and steel saves material and manpower — to the tune of thousands of dollars per home. In addition, strength doesn’t suffer and there’s more room for insulation. The studs in this house are 2x4 at 16-inch spacing. This builder was surprised when I told him that he could space those same studs at 24 inches and save 25 percent of the studs used. This works because the studs are less than 9 feet long and the wind and snow loads in this part of the world are not severe (same is true for much of the U.S.). “But what about 24-inch spacing and 1/2-inch drywall?” he asked. Not a problem. 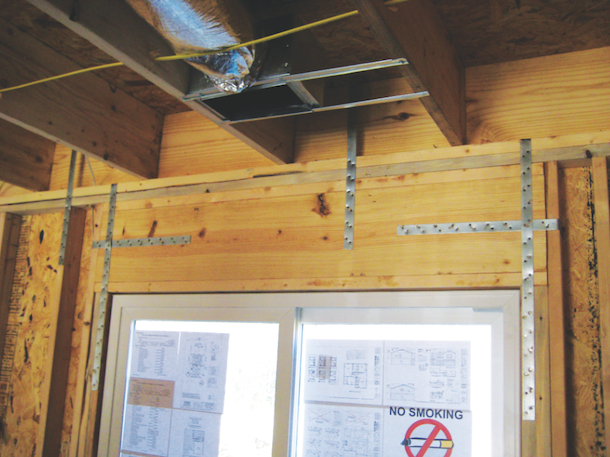 In fact, 1/2-inch drywall over studs at 24 inches can be used as a code-compliant shear wall. In addition, take out all those studs and you get to replace them with about six lineal feet, floor to ceiling, of insulation. Every beam in this house was equipped with a piece of strap bent 90 degrees, apparently to hold the beam in place. The amount of “holding” that these straps will actually do is approximately zero, because they depend on nails to resist pullout and on the bending capacity of a flimsy piece of strap. Straps are very strong in tension, not bending and not compression. What holds this beam in place — and is good for several thousand pounds — is the floor diaphragm nailed to its top. “So we don’t need to use any connector at these beam ends?” my host asked. When the beam is nailed to a floor diaphragm, no. This two-story house had floor-to-floor straps spaced about 4 feet apart, all the way around the perimeter walls. I have never seen this before. What I have seen, and in fact have designed, are floor-to-floor straps at the end of certain, heavily loaded second-floor shear panels — but only when calculations prove that they’re necessary. I’m not sure what the intent of all these straps is. Any strap is only good for resisting tension, so apparently these are intended to keep the second floor from taking off like the second stage of a rocket. The actual uplift forces at the base of this second floor are negative, meaning, “Houston, we have no separation.” But even if there were uplift forces, they could easily be transferred to the first-floor framing via wall sheathing, which this house also features. There are five studs supporting the beam in this photo. I asked the framer about this and he confirmed the same rule of thumb that I’ve been hearing since I was a Vaughn-slinger in the 1970s: “As many studs as the beam is wide.” If you think about that, it’s pretty ridiculous. What if the beam was narrow and tall but had the same capacity as the wide, short one? Our rule of thumb might call for only two studs in that case. What happened? Did the load become less due to a change in beam shape? Of course not. Big beams should be supported on the number of studs, or size of post, that calculates. I ran a quick check on the beam in my photo and found that it is sized correctly; it needs either a 4x4 or two 2x4s to support each end. We just saved six studs (three at each end) on this one beam. This house had several such beams. Here is another framing puzzle I’ve never before seen: a cripple wall rim joist. 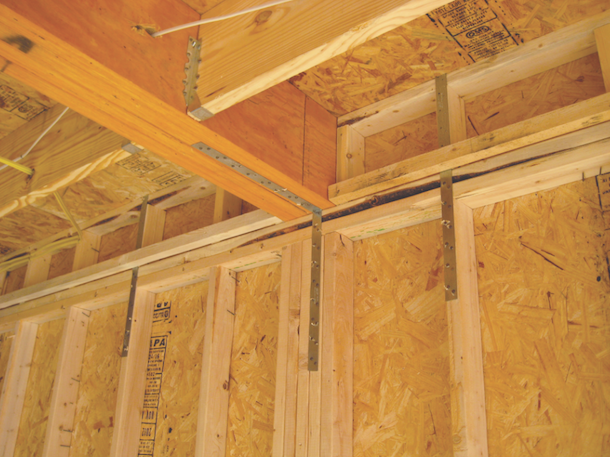 Why not use a 2x12 or LSL rim joist? It would be a lot quicker and easier to install and would probably consume less wood. Also, it would provide a great place for a horizontal joint in the OSB sheathing. Recall in item No. 3 above that we wanted to get rid of all those floor-to-floor straps. Well, if we use a solid-rim joist and locate the horizontal sheathing joint over it, we get edge nailing into the same structural member (the rim), thereby positively connecting the upper and lower floors. This header, spanning 5 feet, is a 4x12, with additional 2x spacers top and bottom. There is so much wasted wood here we could practically build an entire third-world dwelling with it. This header could have been a 2x8 or 4x6. These straps are apparently intended to keep the header from shooting around like a billiard ball. But the header is nailed to the top plate, king studs, and sheathing, which will arrest any possible unruly movement. The header is supported at each end by two 2x4 trimmers. One is more than enough. Each window has four cripples holding up a window sill. How much load could a window sill possibly apply to a cripple? As long as the vertical distance between window sill and mud sill is 24 inches or less (the distance 1/2-inch drywall can span) no cripples are needed. The sill will be held by end nails to the trimmers, sheathing nails on the outside, and drywall nails on the inside. If you were worried about the possibility of a large person one day sitting on the sill, or a place to mount an electrical outlet under the window, you could use one cripple in the middle. I’m shocked every time I see a stick-framed roof in a production home. 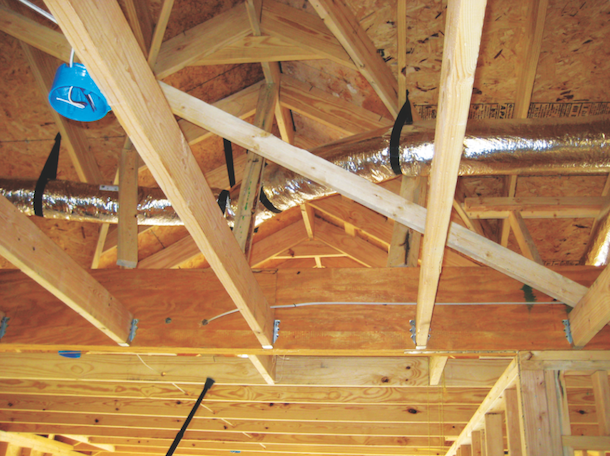 Pre-engineered trusses are probably the most efficient structural devices known to mankind. They’re simple and quick to install, strong, and, with fierce competition in that industry, relatively cheap. Plus, they come with an engineer’s stamp. This stick-framed roof, on the other hand, would never calculate and took framers quite a while to cobble together. “But the cost is about the same,” my host said. That’s because you’re building something that doesn’t meet code. If this roof was properly designed, it would not be cheaper than trusses. This beam exists because the roof system is stick framed. If trusses were used, this beam would go away. And when ceiling beams go away so does the need for interior posts and interior footings. This particular beam is skinny and tall and is not connected to a horizontal diaphragm along its top. Here we have the ingredients for a structural disaster. Nearly all beam failures occur because the top (compression side) moves sideways, allowing buckling. To make matters worse, the kickers on top of this beam are actually pushing the top sideways, encouraging a buckling failure. The roof system is supported by 2x4 kickers. I find it astonishing that this house has dozens of do-nothing straps, but here in the attic, where movement of a flimsy but critical kicker could actually happen, the only thing holding said kickers are a few toenails. In summary, while green framing has been around for quite a while, I’m not seeing much evidence that builders are embracing it. The remedy is education. But not just for the people who read magazines such as this one, more importantly for the people who actually nail the pieces together. It’s pretty clear that old rules of thumb and outmoded methods are surviving and are being passed along to the next generation. No single green tactic is a life-changer. But add them all up and then multiply by the number of projects per year and suddenly we’re looking as serious dough. 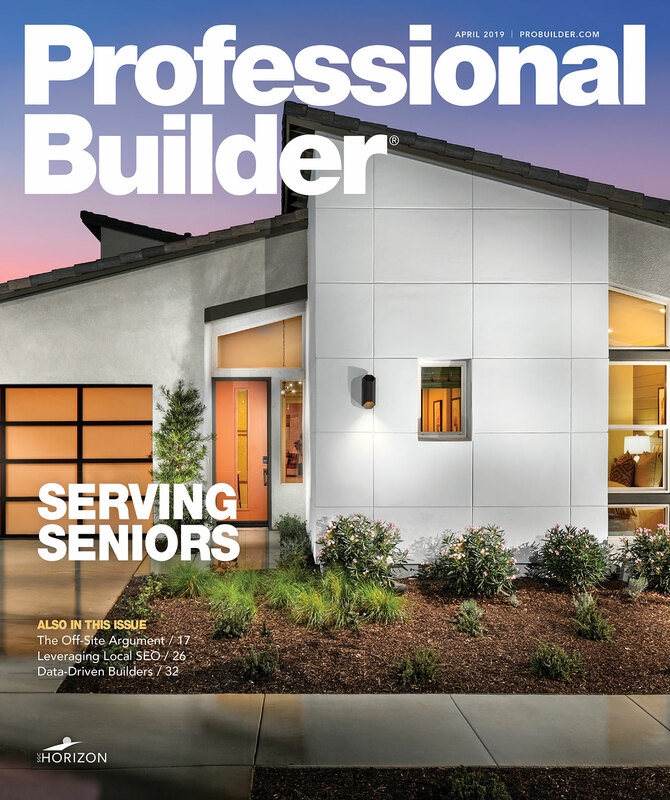 Tim Garrison, P.E., The Builder’s Engineer, is an author, professional speaker, and instructor. He can be contacted at BuildersEngineer.com. I'm a framer. 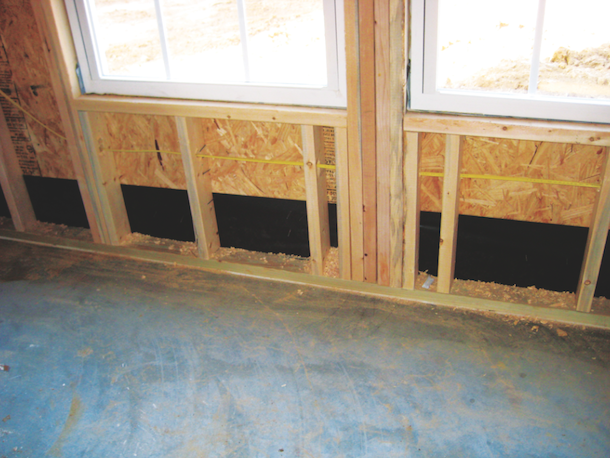 there are more sill cripples underneath the window to maintain the layout for sheeting and drywall, should a sheet happen to land there, not for support. Currently doing a carport to garage conversion. Had good plans, followed advice from planner and inspector. Hired pro framers for that part and let them do their job--under a watchful eye. Strapping is perfectly placed but inspector wants it done so it's anchored to jack stud. Oh well. We'll see.